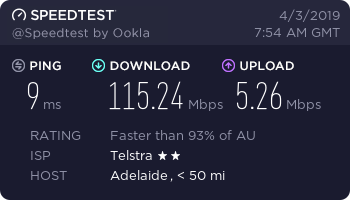 Now that is great... but our area has recently been NBN enabled, so we will need to migrate from Telstra Cable to Telstra NBN Cable (as we are in a two year contract)... which costs $10 p/m more and back down to 50Mbps speed... 1st world problems I know! We need to move onto the NBN in the next 12 months... think I'll put it off for a few months now. Never try live streaming with that upload speed. Signed for 100mbit down (and crawling 5 in up) four years ago, after a year they upgraded to 200/10 without announcement (seems to be a "6 months test period"). Since then I am on 200/10 for the same price. Speeds are even a bit higher than for what I've signed up. Glad I am not belonging to "generation youtube" who streams all his live or work into the internet - maybe I need it somewhen but till then my internet connection surely got an upgrade already (so does the needed stream quality ... so vicious circle). If so you could downgrade to save some money. Haha. We will see. I have feeling Twitch will do just that but YT will come up with some payed live stream thingy where only certified creators can stream. We will see. Imho the EU shot itself in the foot with that regulation. It is only good for publishers and collecting services. The creators will not benefit from it. At some point it will be time to look for a good VPN service outside the EU. For the viewer it might be a solution. For creators not. I remember the time we had our first 10base-T network will all the t-connectors etc. Was cool once the first IPX network games run over it (warcraft 2 and Doom I think). Glad we rapidly "evoluted" to more modern stuff. And as my father convinced me to do proper lan cable connections when moving in I am gigabit ready for many years now - with all cables behind walls or within "cable covers". As we did it properly we also use these cables to transport telephone etc. - including back-channel (don't ask why). Think it also is cooler to plug a network cable into a wall socket than to have all these metres long cables laying behind furniture etc. Only ugly looking thing are the gigabit switches (2x with 8 slots ... connecting the whole non-wifi-stuff). I know, there are rackets with more slots but they were more expensive than two simple 8port switches. Oo-er haha. Nah no such thing. So 13 euro a month, not bad. Think i pay about 40 including telephone. And of course i never thought to use 200mbit down - but for many months now I switch linux mirrors if the remaining download time shows 10 minutes or so - as the mirror switching is done faster than the speed improvement (10min vs 2-3 min). Others are glad to get a 6000k connection (or even slower). Not to think about what swirls around in the air with all that wifi / antenna / ... stuff. Sheer data masses right in front of your nose. I pay 19.95 euro for my 100/40 dsl connection.And every year an additional 70 euros so I get this price. Include dsl/telefon+sim card with telefonflat and 100mb data.